Natural non invasive magnetic therapy that creates maximum sleep power. 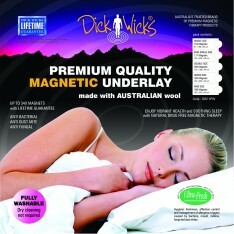 Luxurious premium Australian Plush 350 GSM Superwash wool pile. Ultra fresh performance, antimicrobial for safe and effective control of a wide range of bacteria, fungi, mold and dust mites. Up to 340 magnets, (king size). Assists with peripheral circulation and may assist the healing process. Can be used with an electric blanket. Fitted stretch for the thickest of mattresses. Formeldehyde content rated within Australian Safety Standards.